I have a little confession. A few years ago, I used to not like Oreo biscuits very much. There!!! I said it. But wait, I must also say this. A few months ago, I sorta flipped a switch. I happened to try one again, and I must say, I didn't mind it at all. Don't ask me what happened or how it did, but I can now say I actually like Oreo biscuits. So it was time that I reworked what was originally a recipe that used Oreos, which, when I first made, I actually substituted with another biscuit. But recently, I made them again using the real thing. Sometime in August, we were celebrating a couple of birthdays at work and I decided I was going to bring a batch of these to the celebration. I was a little skeptical of how they would be received, but I shouldn't have been. They disappeared. Not everyone had an opportunity to grab one, but some clever ones managed to get seconds, maybe thirds ;) Those that had a chance to try them out, absolutely loved them. So turns out I didn't have to worry about these at all. I've had a few people ask me for the recipe more than once. So I'm actually doing another post for it. This is one of the easier treats I've made and if you have to take something sweet to a potluck, may I recommend making these. They will be an instant hit. Be warned, they are really moreish. You wont be able to stop at one. Stir in the cream cheese and mix thoroughly. Roll them into balls. Refrigerate them for an hour so that the firm up. Chop the chocolate into small pieces. Melt the chocolate in a microwave safe bowl for 30 seconds and stir. Then as needed microwave in 30 second increments stirring inbetween till the chocolate melts. The stirring helps the chocolate melt. Line a cookie sheet tray with parchment paper. Dip the cookie balls in the melted chocolate. Using a fork, let the excess chocolate drip off and leave them to set on the parchment lined tray. You can serve them up as they are or decorate them with sprinkles or chocolate then do that at this stage and leave it to set. If you want to use sprinkles to decorate them, sprinkle them on the truffles just after you dip them in chocolate. If you want to drizzle some chocolate or candy melts over, microwave them in a microwave safe bowl according to the package instructions. 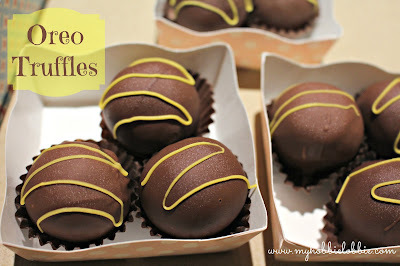 Pour it into an icing bag or a small ziplock bag, snip off the tip of the bag and drizzle the chocolate over the truffles. Leave to set.